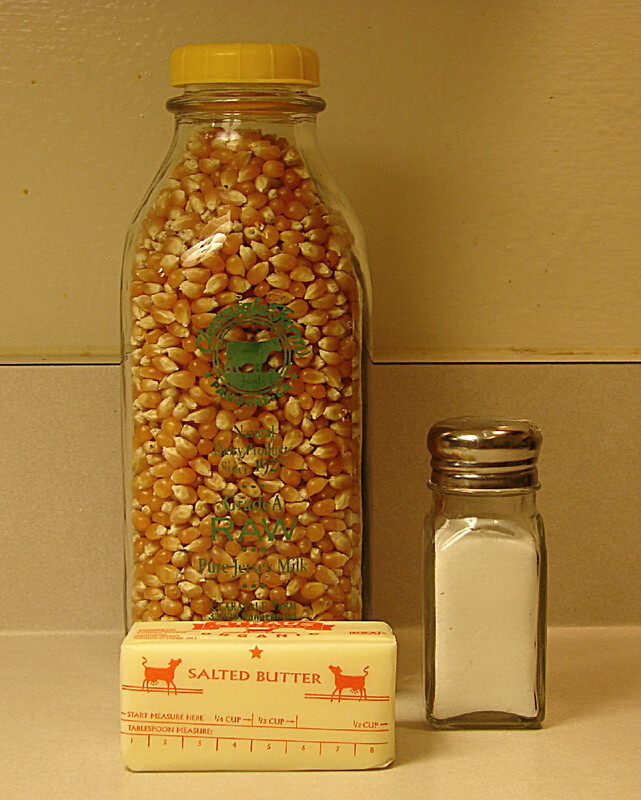 It doesn’t really matter how many kernels you use, but make sure you have a pot big enough for the popped popcorn. 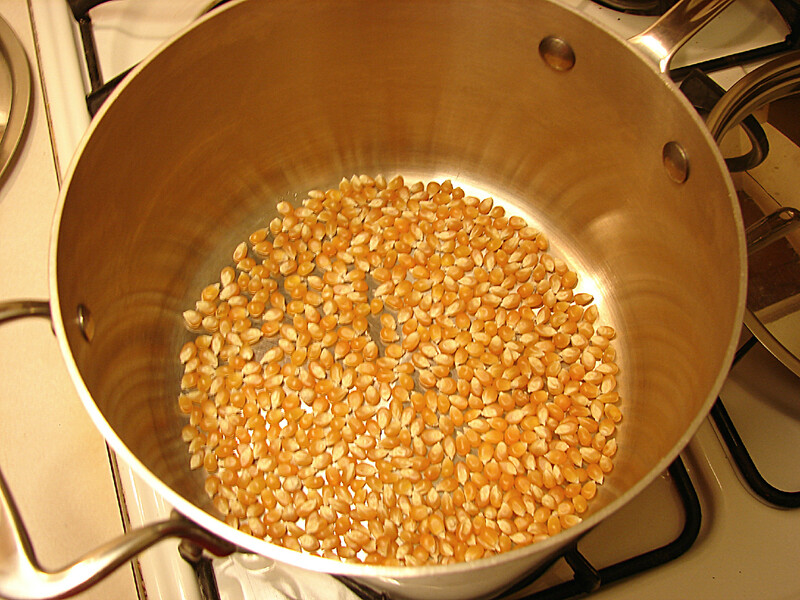 Put some popcorn kernels in a pot. I used a couple handfuls. Put a lid on the pot, and set it over medium heat. Too low and it won’t pop. Too high and it’ll burn. Shake the pot a couple times a minute. It’ll take about five minutes for it to start popping. Once it starts popping keep shaking the pot. Keep the heat on until the popping slows down a lot. Turn off the heat, but leave the lid on and shake it a few more times. Take off the lid and you should have a pot of delicious popcorn. 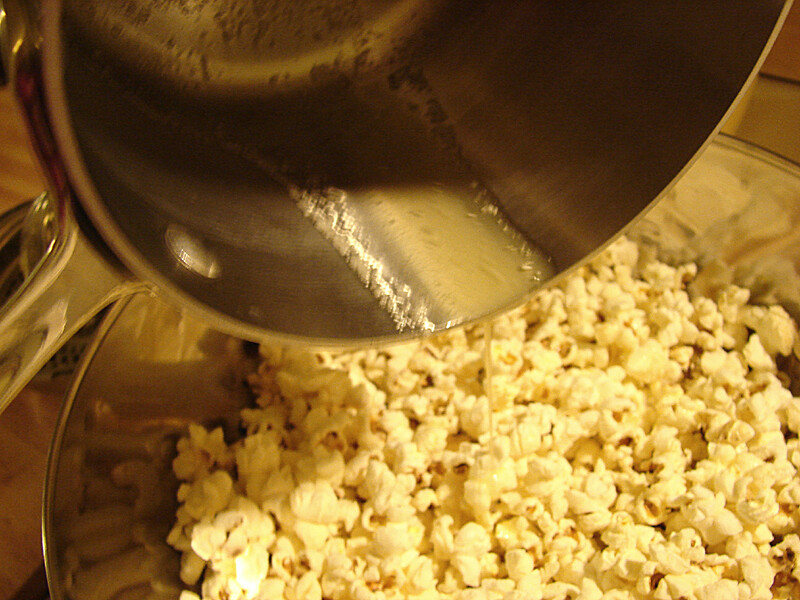 Melt some butter and pour over the popcorn. Add salt to taste and toss. If you enjoyed this post, you may also like my other snack food recipes: Homemade Graham Crackers, Homemade Goldfish, Granola Bars and Wheat Crackers. I had the good fortune of having some of this popcorn made for me recently on a given Sunday by the executive chef herself. I watched in amazment at how simple it was to create a nice warm healthy batch. Could not have taken more than a few minutes and voila! No chemicals, or unecessary ingredients, just pure wholesome goodness, yum!!! And has it escaped anyone that the chef is only 17?!!!! The future of our species may be in good hands just yet! A great addition to a movie night or just lounging around the house. I applaud the idea of creating a safer home, and because there’s so much misinformation out there about PFOA and the Teflon® brand, I’m not surprised that you are concerned. I’m a representative of DuPont and hope you’ll let me share some information with you and your readers so that everyone can make truly informed decisions. DuPont nonstick coatings for cookware are based on PTFE (polytetrafluoroethylene), which is a high performance fluoropolymer. PTFE has received attention in recent years due to questions about PFOA, a processing aid that has been used to manufacture PTFE. Because we recognize that people have questions about PFOA, DuPont has developed patented technology that enables us to make PTFE without the use of PFOA. The important thing to remember is that regulatory authorities around the world have affirmed that cookware made with PTFE-based coatings is safe for its intended use. Thank you for the information, but I don’t believe Teflon is safe and I’ll continue to use my stainless steel pots and pans. The DuPont website says that PFOA will be phased out by 2015. It isn’t 2015 yet. Besides the safety hazard, I don’t like the quality of Teflon. Teflon coating flakes off of pans over time and gets into the food. That’s what happened to my old Teflon pots and pans, and that’s why I chose stainless steel when I replaced them. Additionally, I couldn’t use my metal utensils in my old Teflon pots because they scratched the Teflon. As for the non-stick property, I don’t miss it at all. As long as I use butter and oil, things don’t stick to my stainless steel pots. And even though I’m using butter and oil, I’m perfectly healthy and so is my family. The idea that we should rid our diets of fat is ignorant and dangerous. People have been eating fat for, well, as long as we’ve existed. Since fat has gotten a bad name, people have gotten fatter and unhealthier. Something made in a laboratory has no place in my kitchen.